To understand static, it helps to understand some basic physics with atoms and magnetism. All objects are made up of atoms which have positive and negative charges, like a magnet. Also like magnets, like charges repel each other (positive-positive, or negative-negative), while different charges attract each other (positive-negative). Static electricity is a result of an imbalance between positive and negative charges when two objects or materials come into contact. The surface electrons try to balance each other while the two surfaces are together. When two materials or surfaces are touching, one surface gives up electrons and becomes more positively charged while the other object surface collects extra electrons and becomes more negatively charged. When the two materials are separated, an imbalance occurs when the surfaces are left with either a surplus or shortage of electrons, and the surfaces become electrically charged. These charges build up when they don’t have a direct path to the ground, and can eventually build up enough to cause a spark to a nearby grounded or less charged object in an attempt to balance the charge. When you take off a wool sweater and the hair on your head and arms stand up, the hair acts this way because your body got an extra charge from the friction of the sweater being removed and your hairs are moving away from each other because they all have the same charge. With your laundry, your clothes in the dryer are rubbing up against each other (particularly when you have different types of fabrics in there, like cotton and polyester), those charges will cause the fabrics to cling to your body. Lightning is another example of static discharge. You see it because electricity is being produced between two clouds or between a cloud and the earth as the static electricity is discharged. Static electricity is very important in many industries as can used to our benefit, or it is a problematic issue that needs to be mitigated, reduced, or removed. For example, some helpful uses in industry are in pollution control – like air purifiers. The air purifier applied a static charge to dirt particles in the air and then passes the air over an electrostatic plate of the opposite electrical charge. The dirt then clings to the plates and can be easily removed. Factories use this same principle on a larger scale for their smokestacks to keep pollution out of the environment. Another use for static electricity is for spray painting car parts. This requires a specialized paint gun that applies an electrostaitc charge to the paint. The parts for painting need to be properly grounded using metal clips, clamps and wires. The charge causes the paint to be attracted to the car parts resulting in an even coat, less mess, and less wasted paint. In other industries, static can cause a lot of problems. Sparks caused by static can cause fires and explosions. While hazards for fires may be obvious with flammable materials, this can also happen in industries where there is dust, like flour mills. Static electricity is also an issue where electronics are used and manufactured. Static electricity in industry is caused by machinery where this is friction and contact and separation, as well as in instances where there are rapid heat changes. People can build up their own charges simply by the friction created when they walk, so when they move within proximity to a machine, they can receive a shock. Static sparks can be very serious in industry, not only can they cause an ignition or explosion but they can also cause a burn or stop someone’s heart. Some other sources of static electricity production in industry can be liquid flowing through a pipe, hose or opening, blending or mixing, spraying or coating, filling drums, cans, pails, or tanks and conveyer belts. Electrical charges can also build up in flammable liquids when they flow through pipe systems or when they splash due to being moved in their storage containers. Humidity is a significant factor as moisture in the air helps to remove some charge. Dry environments are much more prone to static buildup. Different materials and production speeds also play a role in how much and how fast static is created. Static electricity in industry is controlled by several methods. We will focus on the most common of these methods, Bonding and Grounding. Bonding is when two or more conductive objects are connected with a conductor like a wire, which helps to equalize the charge between them. Bonding doesn’t eliminate static electricity but it does ensure that a spark will not happen between the objects. An example of a cable used for bonding is to the left. In this example, two copper clips are on either end of a wire and clip directly to the items being bonded. Grounding is when objects that can gain a charge are connected directly into the earth using metal like grounding rods, copper, and steel. 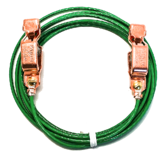 Grounding drains the static charges away as they are produced. Grounding and bonding connections are made with connectors using metal clips, clamps and wires. A grounding/bonding assembly is a clamp or clip with a grounding cable or wire. One end attaches to the item being grounded or bonded. The other end attaches to the ground, whether it be a ground rod or a grounding "bus" mounted on a wall. Ground connectivity of all devices, cables and connections must be checked at installation and regularly afterwards for safety and to ensure the connection is maintained. 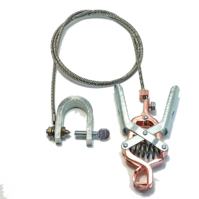 Many grounding clips and clamps have a paint-piercing ability to ensure a metal-on-metal connection. Check out Mueller Electric's catalog for more examples of grounding and bonding equipment.